Three years ago, a mysterious dimensional gate opened in New York City, and aliens from the Beyond came through. The city was reconfigured into a different form, and also sealed within a barrier of fog and magic to contain the damage. Since that day, the aliens and humans in NYC, now called Hellsalem’s Lot, somehow manage to co-exist together, merging cultures and helping each other — for the most part. When the tensions between worlds gets out of control, it’s up to the secret crime fighting group Libra to handle it. 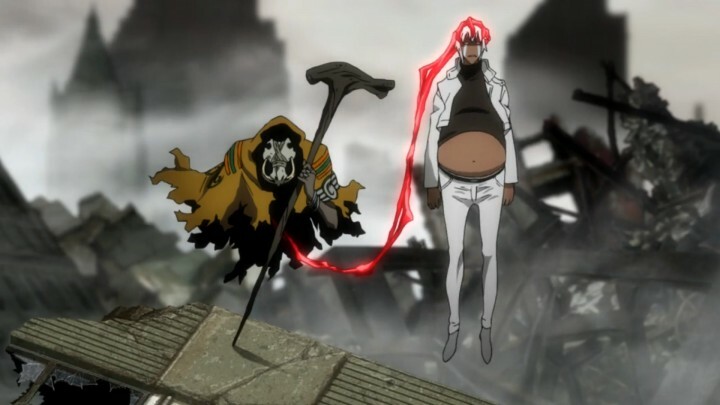 This setup for Kekkai Sensen (Blood Blockade Battlefront) leads to an episodic anime series full of craziness — absolutely over-the-top, absurd, and riotous craziness. And that’s not just referring to the action scenes or characters, but the way the entire show is directed too. It’s a quirky, super stylish, and often hilarious anime that’s thoroughly enjoyable the entire way. 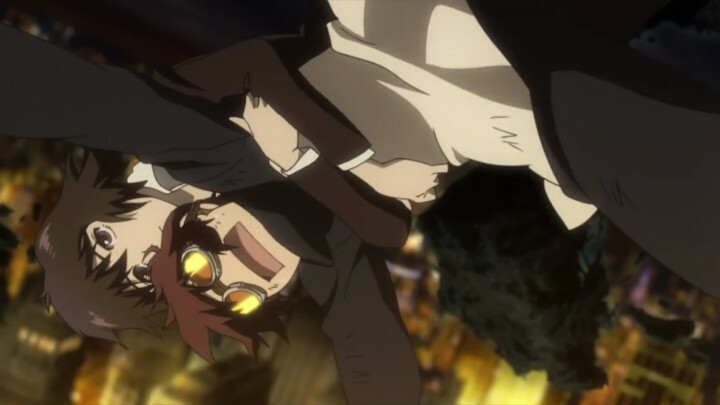 While there are some lackluster moments and some flimsy storytelling, Kekkai Sensen is pure fun, and it knows it. Kekkai Sensen throws you right into the thick of it without any explanation of what’s going on, who’s who, or why things are happening. We just see a young photographer named Leonardo Watch running frantically after a monkey, before almost getting blown up by random missiles. Luckily, he gets thrown right at a man named Zapp’s feet, who mistakes him as a new recruit for Libra. It turns out that Leo has coincidentally been searching for Libra all along, the underground crime-fighting organization that maintains the balance between worlds. 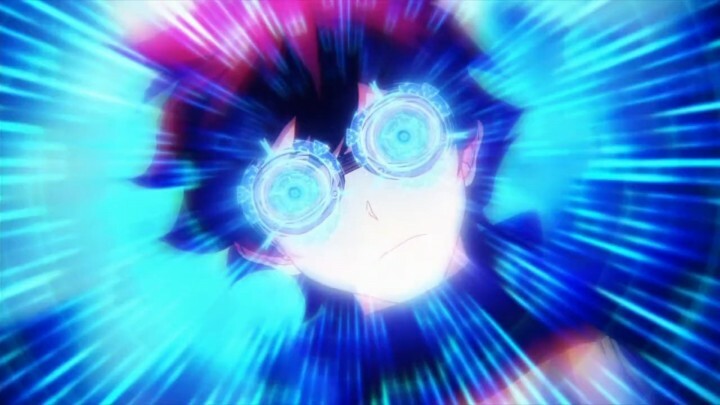 He somehow obtained the “All Seeing Eyes of God” from a strange entity, giving him a variety of visual powers in exchange for his sister’s eyesight. He hopes that Libra can one day help his sister’s condition, and ends up joining them after another ridiculous chase scene where entire buildings get destroyed. It’s quickly obvious that there’s never a “normal” day in Hellsalem’s Lot. 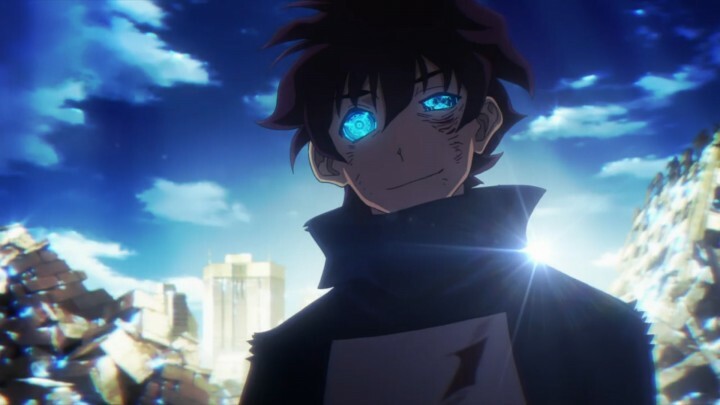 Even without knowing what’s going on, Kekkai Sensen instantly intrigued me with cool powers, stylish characters, and the weird and crazy world they live in. Libra’s members fight with special abilities that use their own blood, becoming swords, tornadoes, and other magic-like skills. Attacks have a very shounen-style flair to them, complete with kanji characters boldy stamped on the screen as they’re activated. The characters themselves are equally flashy, like the thoughtful beast-of-a-man Klaus as Libra’s leader, and the hilariously obnoxious Zapp. I soon got to know that they’re actually par for the course when it comes to Hellsalem’s Lot’s inhabitants — and that’s part of why the anime’s so fun. The humor in Kekkai Sensen really hit the mark for me. 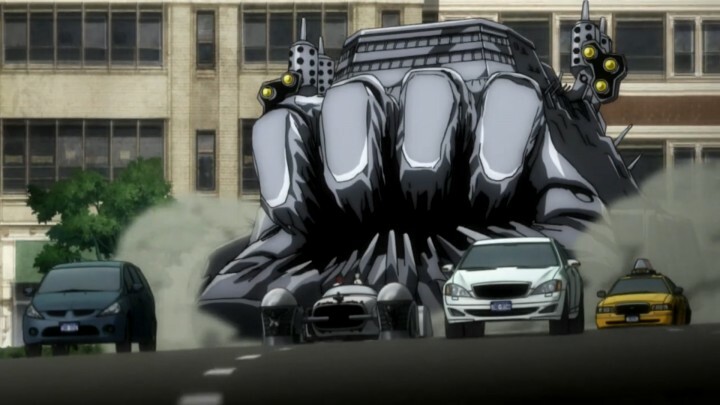 I also want to point out that the humor in Kekkai Sensen really hit the mark for me. The comedy is over-the-top, yet somehow stays away from the “trying too hard” zone. It might not be to everyone’s taste, but I certainly laughed out loud quite a lot even in these first few episodes. 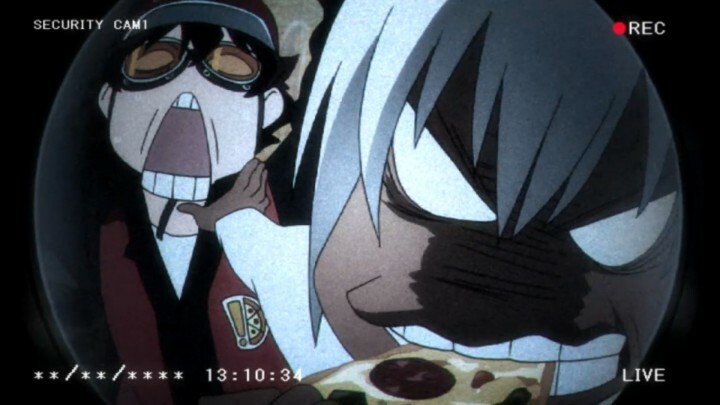 Scenes of Zapp bullying Leo are particularly funny, like the montage of methods Zapp uses to mercilessly beat up Leo to steal his pizza. 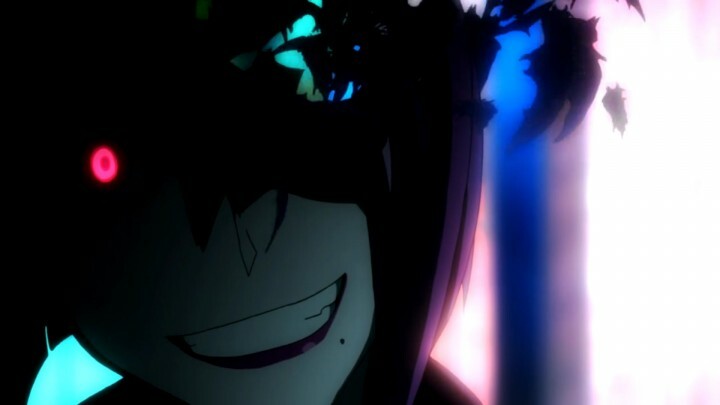 As for the plot, because Kekkai Sensen is an episodic anime, most of the storytelling relies on self-contained episodes that show how Libra works to take down criminals. Sometimes the show switches to different characters to see their perspective, with the purpose of providing more insight into the state of Hellsalem’s Lot and its residents. But because of the sometimes jumpy nature of the storytelling, the show can feel messy and random at times. But each episode still manages to entertain with its own mini-plot, complete with a quirky set of characters and setpieces. And there are some subtle hints that allude to something bigger, with odd characters that briefly appear like Femt and White. So there is some anticipation for a meatier climax to come. To spice things up even more, a new threat emerges with the Elder Blood Breeds, immortal vampire-like beings with incredible power. They give Libra an enemy to focus on from episode to episode, making the anime’s plot a bit more consistent with an element of continuity. Instead of just having short adventures versus low-level thugs, we get glimpses at a bigger threat that’s looming in the background, waiting for the right time. It’s really enjoyable to watch Libra coordinate as a team. If you can believe it, episodes also start getting even more over-the-top, highlighted by a fight with a giant mecha-truck with a mouth. It’s really enjoyable to watch Libra members coordinate as a team to take down this monster. As the battle builds and builds, we’re treated to an energetic sequence of special moves and comedic moments until there’s a literal cathartic explosion. These kind of scenes are where Kekkai Sensen shines, and it’s been quite consistent so far in pulling them off. In addition to these great action setpieces, Kekkai Sensen‘s humor is still going strong. Each character plays their role well, and mixing them together always makes for a fun time. Zapp in particular continues to be the comedy highlight, being the most intense and reactive of the group. Somehow he doesn’t get obnoxious, but that may be due to the anime’s writers smartly knowing when to back off and not have him overstay his welcome. Also included in this excellent batch of episodes is an unexpectedly touching message about the relationship between humans and aliens. Leo befriends a funny little alien named Nej, and he helps him buy his favorite burgers from a human-run restaurant. As Nej puts it, the burger joint is “farther than the moon” to him, because of the distance due to discrimination from other humans who aren’t as accepting. Through their friendship, we’re also shown the disturbing side of racial tensions in Hellsalem’s Lot, as humans abuse aliens for their own gain. 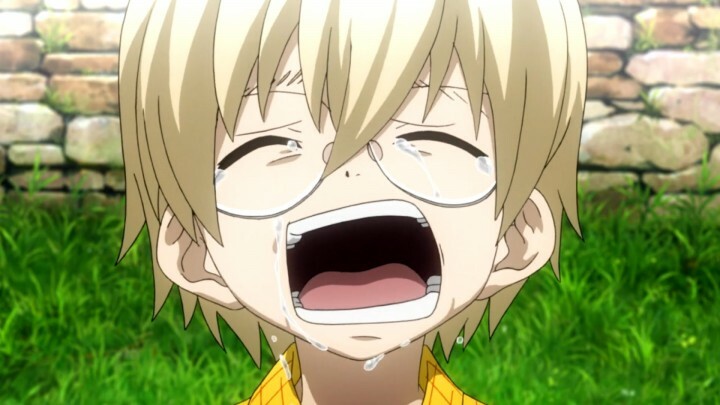 It was a surprisingly emotional sequence that really stuck out from the usual crazy antics of Kekkai Sensen. Taking a break from more serious matters, we get a fun breather episode when Klaus enters a cage fight. We do get a few small hints about how Blood Breeds operate, but mostly it’s just a good time to have some laughs and watch Klaus bust some heads. Soon after, we meet Zapp’s master, who forces Zapp into deadly but hilarious situations in order to prepare him for battle against Blood Breeds. 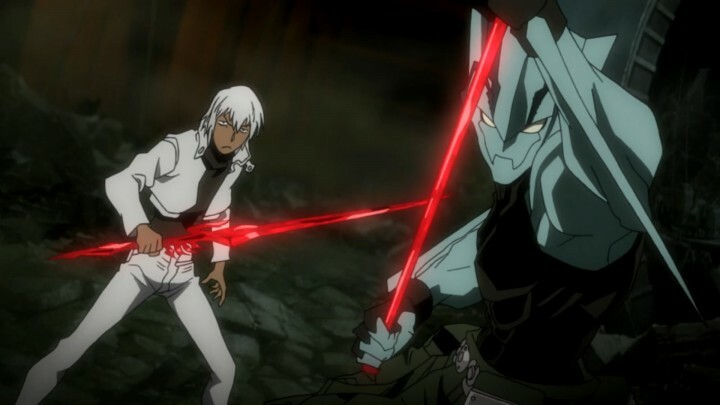 By now, Zapp has easily cemented himself as my favorite character, with a very weird balance of being both absurd and badass at the same time. Though most of time, he’s more absurd than badass. We also learn a bit more about Blood Breeds and how to defeat them. They don’t feel like invincible enemies anymore, and there’s a taste of what the Libra team needs to do to defeat them. The action scenes in Kekkai Sensen are at their best when they involve fluid teamwork, and we get another short and sweet one here. It sets up an exciting anticipation for an even more epic battle to come. Extended flashbacks and conversations really slow the pacing down. 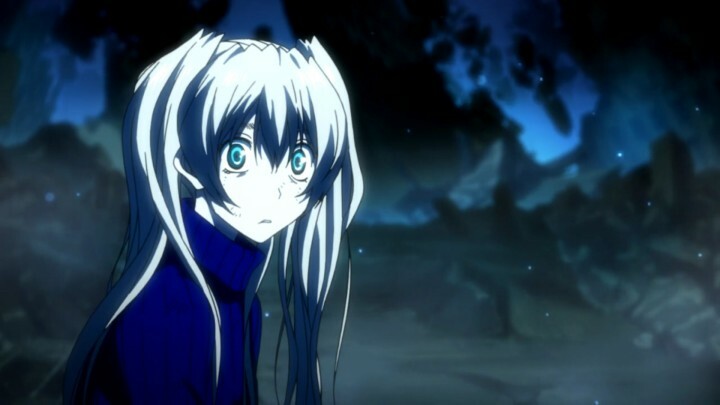 To start heading toward the anime’s impending climax, the mystery of White and her recently introduced brother Black gets a little more attention. Unfortunately, their extended flashbacks and conversations really slow the pacing down, which is odd in an anime that is full of quick cuts and spontaneous transitions. For part of an episode it actually started to feel boring — which is a rare occurrence in Kekkai Sensen. 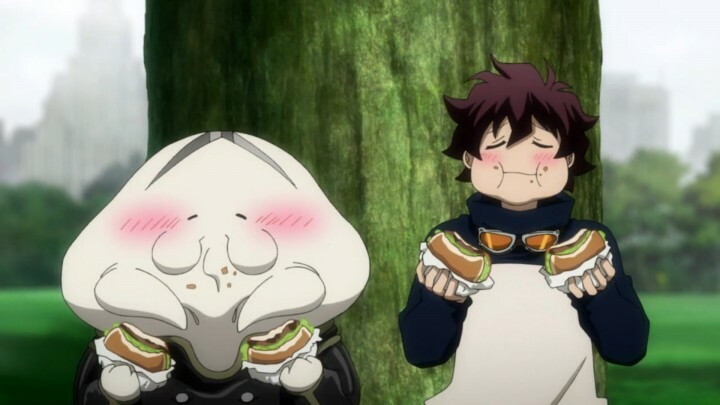 Before Kekkai Sensen enters its final chapter, it takes a break to tackle a very important issue: lunch! The dichotomy between what’s considered “normal” and not in the human/alien melting pot of Hellsalem’s Lot tortures Leo and friends as they struggle just to eat something reasonable. 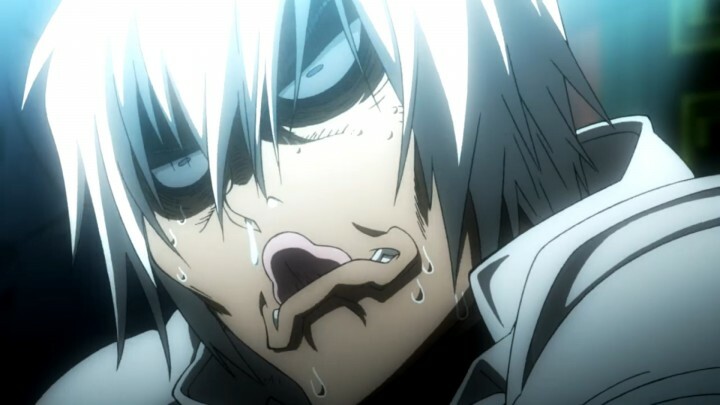 Kekkai Sensen‘s comedy is at its best here, with rapid-fire scenes of outlandish setups and reactions. It’s a welcome change of pace after the dry exposition just an episode ago. However, the fun is short-lived as we get more pace-killing flashbacks about the twins, White and Black. For an anime that usually encourages us to fill in the blanks, it’s strangely heavy on exposition when it comes to these two. I think it’s intended to help the viewer sympathize with them more, but honestly I felt more moved by Nej’s dialogue-free montage a few episodes ago. The length and content of these twins’ backstory could have been condensed better, to fit with the tone of the rest of the show. But this difference might just be due to the fact that they’re anime original characters that didn’t exist in the manga. Finally, after some inexplicable events, Hellsalem’s Lot becomes a chaos bed full of zombies, explosions, and wrecked buildings with another imminent catastrophe. Libra’s teamwork is again on creative display as they baton pass Leo to his goal. While each member only gets a small bit of screen time, their unique personalities all shine through — a testament to the great character design. The fun is back, but its tinged with more seriousness this time as there’s something truly at stake now. I really appreciated how the anime was able to maintain its goofy high energy style without diluting the gravity of events during these final climactic scenes. In the end, Kekkai Sensen tries to end on a more thoughtful note, touching on typical shounen themes like hope and believing in yourself. Honestly, because of the sharp contrast with the absolute insanity that is usually going on, I felt that the message hit home more effectively. The final moments were a subdued, but heartfelt, way to wind down the series, and I felt quite satisfied as the credits rolled by. 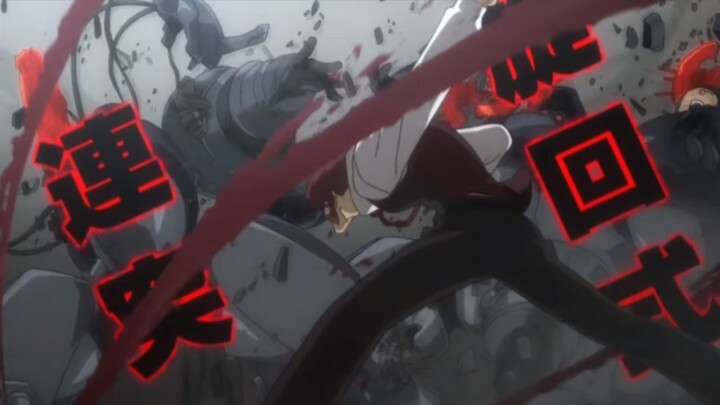 There’s a lot to like about Kekkai Sensen: the action, the comedy, the style…especially the style. It’s definitely one of the more distinctive anime that I’ve watched, not in terms of pure creativity, but in how it melds so many concepts together so well. Like its own fictional city of Hellsalem’s Lot, it’s a true melting pot of odds and ends that just somehow works. It’s not a perfect show by any means, but it’s perfectly enjoyable as what it is. 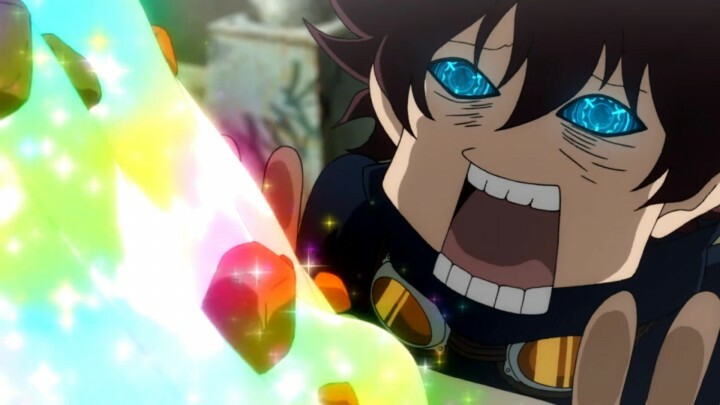 If you want a fun anime that really knows how to play to its strengths, Kekkai Sensen is a must-watch.